This building crowns a prolific career of poetical research and technical invention by Alejandro de la Sota. It also demonstrates the long creative evolution of modern architecture in Europe. 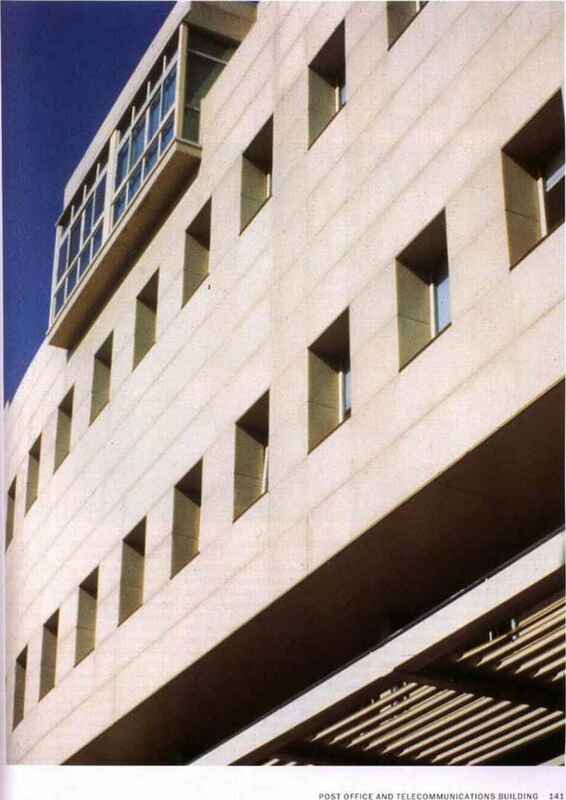 Two of his earlier buildings, the Government Building of Tarragona, in the late 1950s, and the Colegio Maravillas in Madrid, of 1961. are among the most outstanding examples of the kind of post-war architecture we call "realist-. The León building shows that the trend is not exhausted. It is a public building but de la Sota in his realist, anti-rhetorical way has excluded all rhetorical devices from it. In his characteristically anti-monumental approach, his concerns are pragmatic. For the walls, he used panels usually employed in Spanish supermarkets, remarking. 'Here they were used for a quite singular, very important building, and the result is perfectly acceptable." Couleur local was respected by painting them In 'León colour". 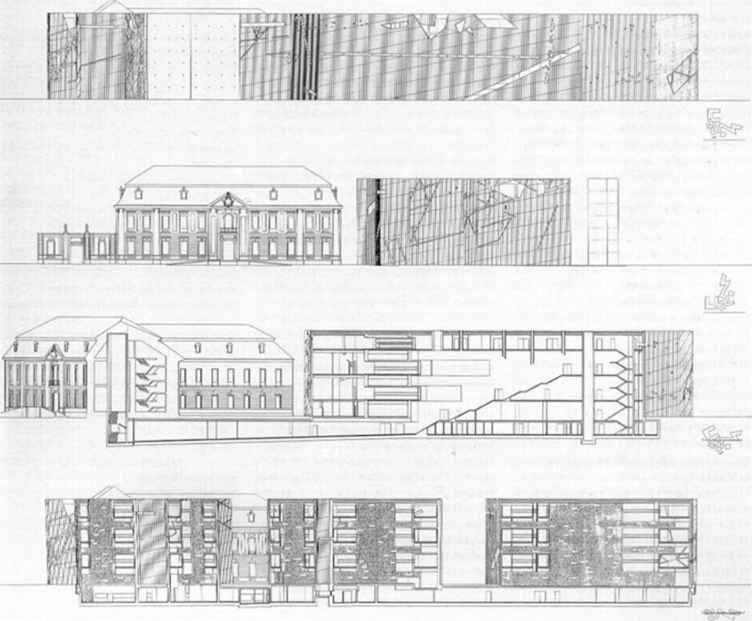 Equally pragmatic was the spatial organization of the building which, in accordance with implicit realist principles, had to take account of the constraints of the programme interpreted in the framework of spatial structure. This organization is of paradigmatic simplicity: a rectangular prism divides space into 4x8x11 3 dimensional grid units. Within this subdivision a 4*8*4 sub-system is embedded for bearing elements. Finally, interwoven in a parallelepiped pattern, partitions are positioned to create a paratactic arrangement of functional zones. Such an overlay of three systems could have belonged to any ordinary, mainstream building, but in this case the effortless exactness with which each system nestles inside the other results in a faultless, original synthesis. As the prominent Spanish architect Julio Cano Lasso has observed, de la Sota 'has transformed reality into poetic material" and, indeed, the building gives the kind of satisfaction works of poetry offer. Envisaging as a coherent whole every component of a building, structural, spatial or functional, requires skills acquired from a long-accumulated knowledge of the tradition of classical and modern international architecture. This tradition involves the practice of physically embedding heterogeneous spatial components - structural, functional, ornamental. iconographlc - one inside the other without imposing on each other's integrity and without creating new contradictions. This was successfully accomplished in Spain at least as far back as the work of the Renaissance architect Juan Herrera. But it can be regarded as going even further back, to the classical principle of taxis, the rule system for partitioning space, and its prime paradigm, the classical temple. Dc lo Sota dutifully acknowledges this debt, and in an essay. 'Experiences', he placed a photograph of himself posing in front of the Parthenon and referred to Schinkel as the 'passport' that saw him through his studies. He also credited Juan and Emilio Moya. Modesto Lopez Otero and Pascual Bravo, all adherents of the classical tradition. Nevertheless, de la Sota refers to another tradition, that of going beyond tradition. In the entirely original structural, divisional and functional zoning frames of the Post Office building. the freshness of his approach to such coordination problems is inspired by the work of two other great Spanish innovators. Antonio Flores and Antonio Palacios. 'We suffer from the ceiling', de la Sota says, referring to the low level of accumulated knowledge and 'collective memory'. This leads to 'an architecture that was - and threatened always to be - the same". His solution Is to recommend the 'union of different elements in order to obtain a third . . . (which) contains something new'. And this is precisely the case with the LeOn building. 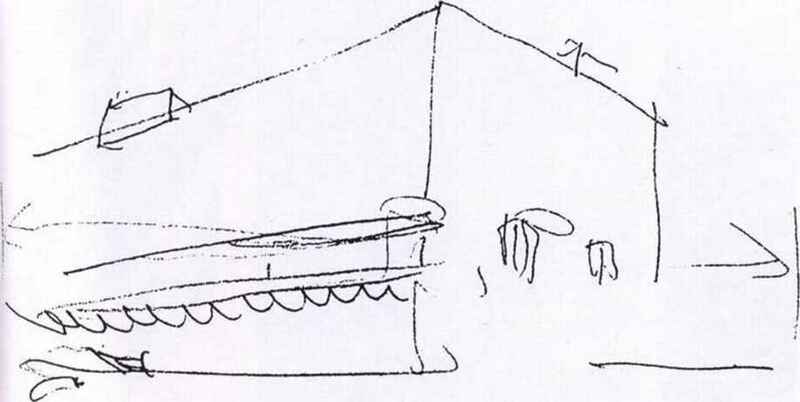 As much as one can identify in its conception the classical canon (the formidable Herreran 'cube', with all its historical connotations of repressive order), one is equally reminded, in the scheme's poetics of newness, of early Gropius, Breuer and Neutra. and even Hannes Meyer. Max Bill or the Eameses. Characteristically, de la Sota's unpretentious description of his building was that 'the idea was to make a cube that works, and that would be adaptable to future changes'. (Opposite) Conceptual drawing and first flow plan not so.' Newness might also win. he remincs us. For a realist, much as memory is not * I overriding norm, newness is not autonomous | According lo de la Sota. newness is end<N*: I with precedent experience. As in a game chess, one of de la Sota's favourite metap'm for design. 'Moving a simple pawn can te enough for the whole game to take on a ne» I light... a change in the placing of a pillar, i change in the quality of one of the materials.. I in the... conception of the Job will complete alter the resulting architecture.' The way« which different components are combined 11 the León Post Office does indeed bring to wí I the intelligence required in a game of chess. 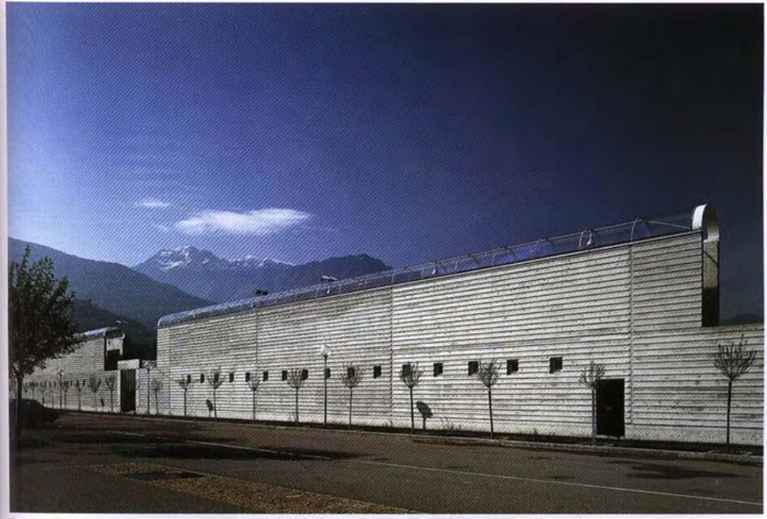 Galfetti is one oí the major figures of the group of Ticinese architects made up of Mario Botta (pp. 64-67). Flora Ruchat and Luigi Snozzi (pp. 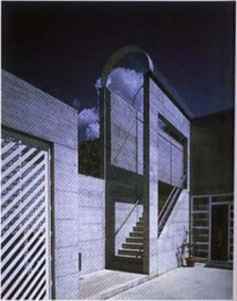 80-81) among others, who were identified by the architectural historian Kenneth Frampton with the broader international trend of critical regionalism and assigned the function of cultural critics. 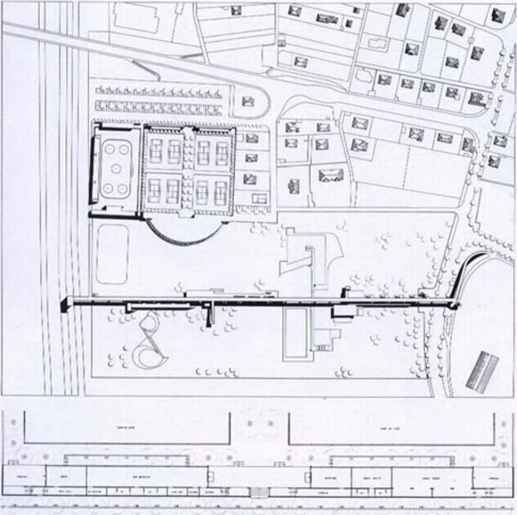 Galfetti and his associates designed a community swimming facility in 1967-70. It is now the nucleus of a new recreational complex that includes this tennis club. The brief envisaged. in addition to 8 courts, a small restaurant and clubhouse. 4 changing rooms. 32 showers. 12 toilets and various storehouses and technical installations. The special feature of the new building is that, like a wall, it supports but also encloses: it both houses the services of the club and forms a barrier separating the facilities from the rest of the town. (Above and opposite, above) Two views of Um entrance above the valley floor. The magnificent »aft still dominate the morphology and life of the city and its passageways remain importarr public spaces and pedestrian circulate paths. Once their restoration, which Galfetti S directing, is complete, they will house banquet rooms, a restaurant, exhibition halls and meet ing rooms. goes back to great figures like Fontana. Vaderno. Borromini. but also to generations of 'umoie. anonymous builders whose excel nee and skill have been renowned since the fena-ssance in Italy and Switzerland and »•ose dignified and dedicated way of life the Mrket and industry have ended. Indeed, the exposed reinforced concrete •aihasa highly photogenic sculptural surface toture as a result of the intricacy of the construction technique. It allows for deep tnuontal stripes of shadow alternating with " n. flat, lighted surfaces immaculately executed through the use of form work. The plastic MMy of the technique is made to emerge by e^osmg the materials of the object and the neans of its production. Concrete is left j meowed and the fact that it has been cast is fcegrounded by giving to the wood forms an expressive profile and by letting the joints between form-work be visible. 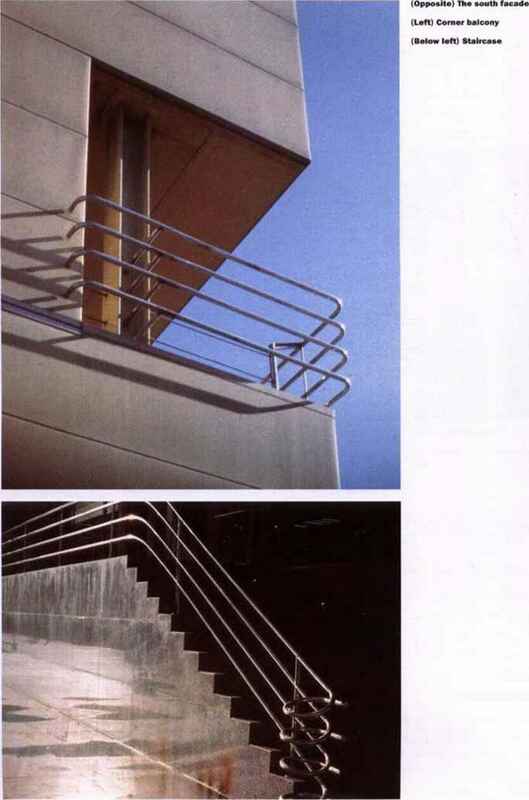 Certainly, neo-brutalism did precisely that, and "brutally', but the Bellmzona Club does it with extreme refinement. From the purely formal point of view, this technique of casting has a wonderful optical effect of horizontality which helps to underline the distinct profile of the mountainscape in the background. By contrast to it the same technique is also used in the early Botta and Snozzi work (pp. 64-67.80-81). in which the use of pure prismatic volumes serves to foreground the specific irregular forms of the natural landscape as well as their irregularity. dominated societies in the world, where exposed concrete is treated as if it were made out of precious material. One would search in vain here for a nostalgic return to the past. In fact. Galfetti is polemically opposed to such easy formulas. His architecture may come from a strong attachment to memory, but it is also the product of a search for inventive ways of renewing it and adapting to the new realities of an increasingly international world. This is what makes it not Just regionalist. but critical regionalist. It is intriguing also how in a reversal of roles, the refined and precious, as well as the regional and crafted, have increasingly become, in the midst of the devaluation of culture and community, the aesthetics of radicalism and an expression of what the American critic Lionel Trilling called adversary culture'. Classical and industrial, proletarian and aristocratic. reminiscent of Louis XIV facades, but inspired by the garden city ideal; serving equally well absolutist and socialist politicians. 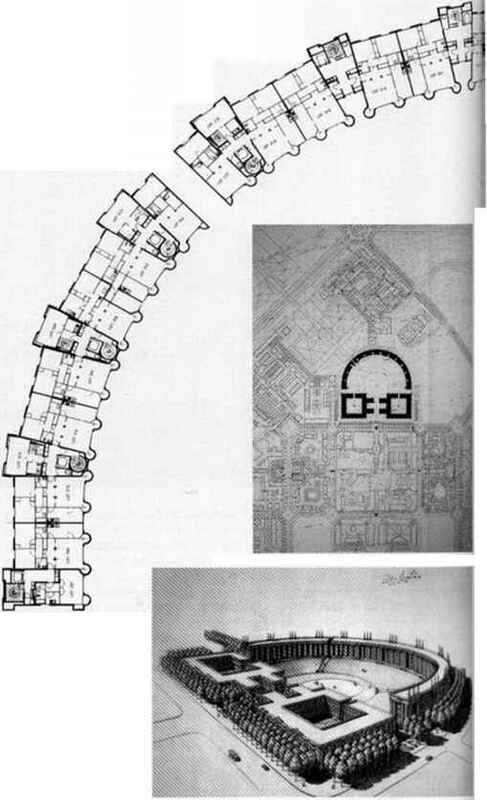 claiming monumentally and fulfilling to the last detail the pedestrian requirements of planning authorities, this housing project is one of the most coherent examples in the constellation of neo-monumental complexes by Ricardo Bofill. The architect of 'subsidized Doric', he has been likened in the same breath to Michelangelo. Gaudi. Cecil B. de Mille and Albert Speer. 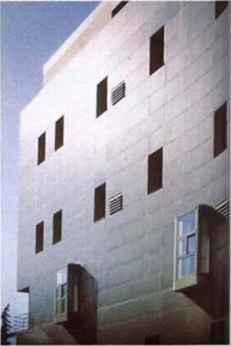 While such characterizations of Bofill express the polymorphous nature of his oeuvre. they are also a measure of the slackness of the media of our time. Les Colonnes dominates the valley of the River Oise In the new town of Cergy Pontoise. on the plateau of Le Puiseau. It occupies the highest point, where the principal axis of the new neighbourhood intersects a linear layout of parks, hanging gardens and terraces over the river. It is composed of two distinctly morphological parts: a six-storeyed crescent to the south, oriented towards the valley: and two symmetrical, square plazas with four storeys to the north, connected by a cross-shaped plaza and cross-axis. The composition, which is structured by a complex geometric system based on the square, draws upon the precedents of the classical English architecture of squares and gardens, such as the Circus and Royal Crescent by the John Woods in Bath. It departs, however, from a classical scheme in the way in which it relates and articulates buildings and regulates controlled interior spaces. 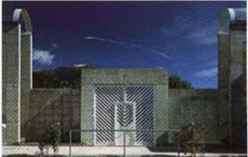 The complex, which is both eclectic and picturesque in its planning, is not closed to the surrounding landscape. 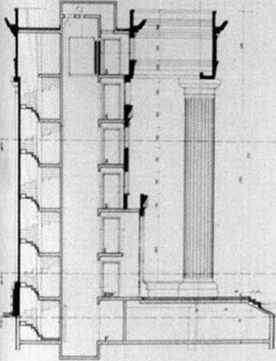 At the edge of the plateau, above the valley, the facade of the crescent is, according to Bofill. 'treated like a grand city hall, punctuated by solid towers between which are placed apartment blocks, their French windows overlooking the natural theatre, like so many historic walls that have been progressively domesticated and transformed (for example Urbino. or the cities so characteristic of the Yemen).' The facade is intended to serve as the termination of the perspective created by the axis of the gardens and terraces rising from the river.